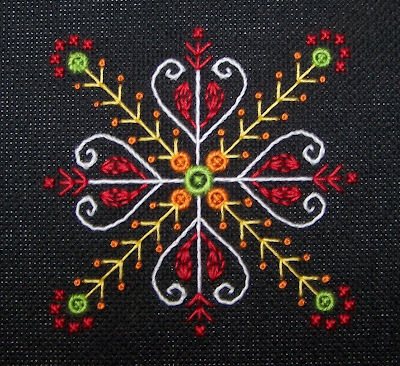 I took Ukrainian Eggs a Cyber workshop by Michele Roberts from ANG (American Needlepoint Guild). There is a picture of the finished eggs if you scroll down on this page. The project included 7 egg patterns. I have completed the stitching for 3 of the eggs. I had a hard time working on the black in the winter months. I hope to get these out and work on them over the summer when I have better light. Each egg has the symbols explained in the instructions. Michele Roberts writes very good directions. 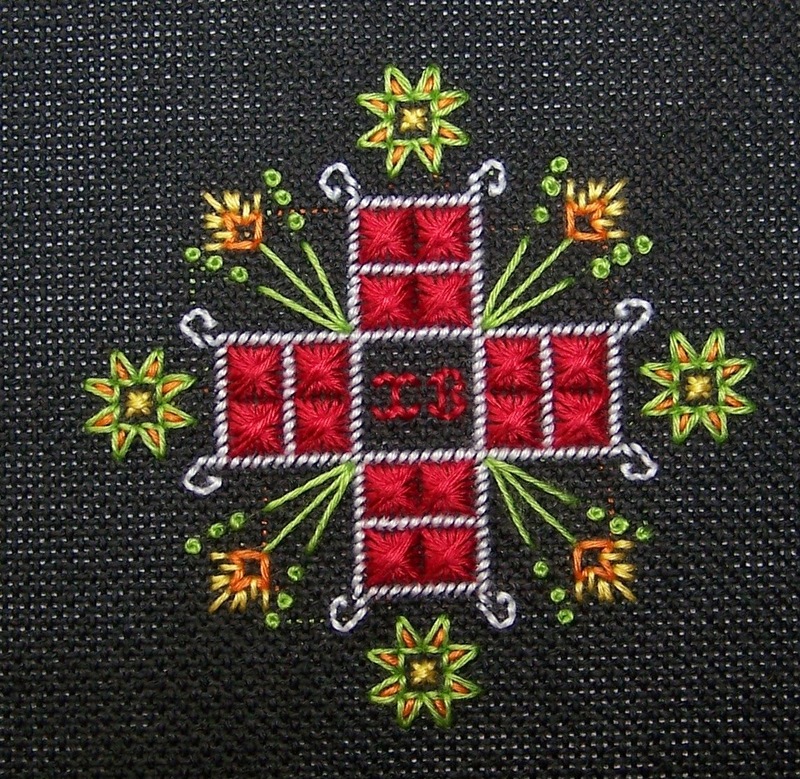 I would recommend anyone who likes needlepoint take her classes. I have a close friend who has a pet hedgehog. I made this for that family. 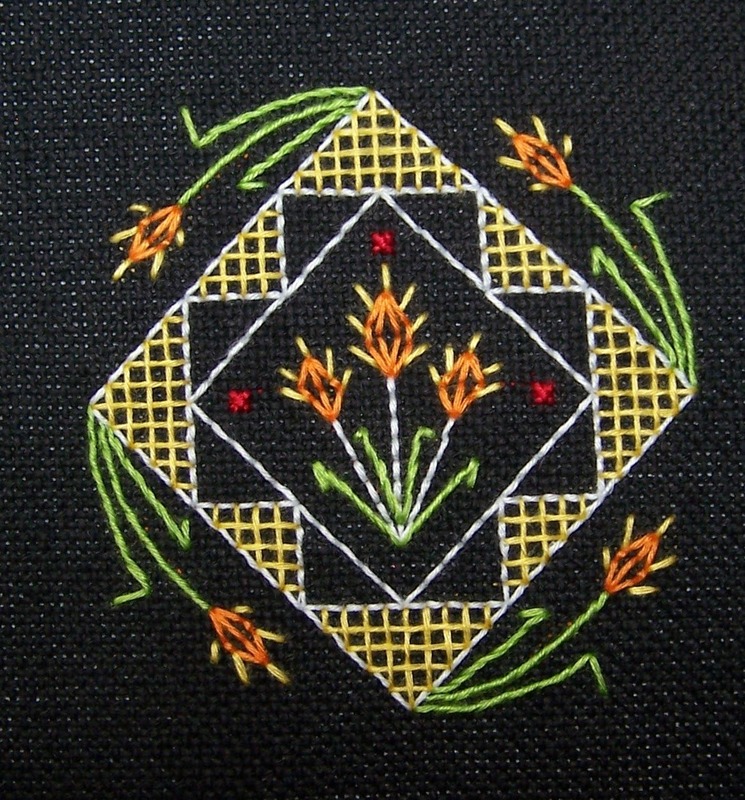 The pattern comes from page 119 of Mary Waring's An Embroidery Pattern Book (Plate LVII). I found the pattern on Pintangle. And I wrote about the book (and all the links I could find to it) here. and Anchor 276 (the lightest shade). 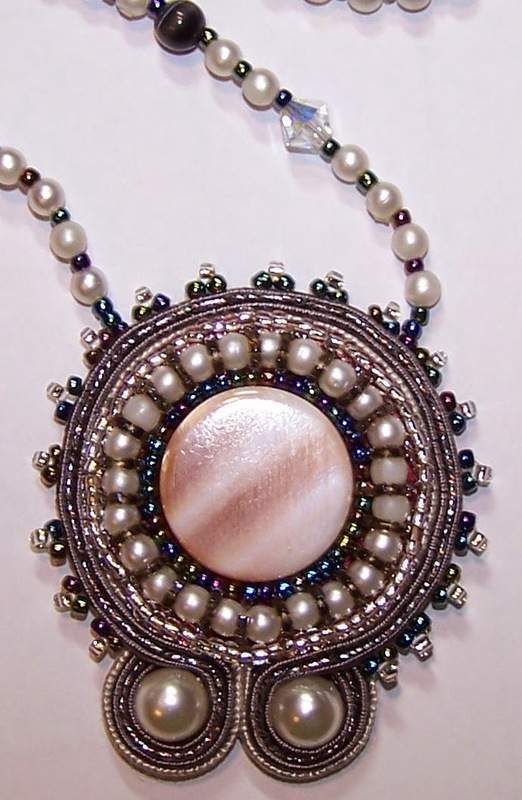 I blended the colors by using 1 strand of 2 different colors. 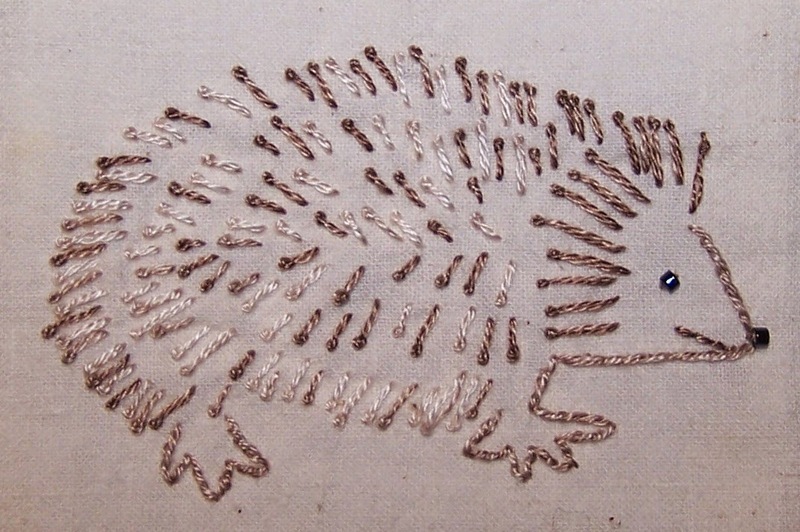 The body is worked in French knots with elongated tails. This is the technique that Gay Ann Rogers used for Elizabeth's hair. The nose and eye are Delica beads I have labeled as 002. 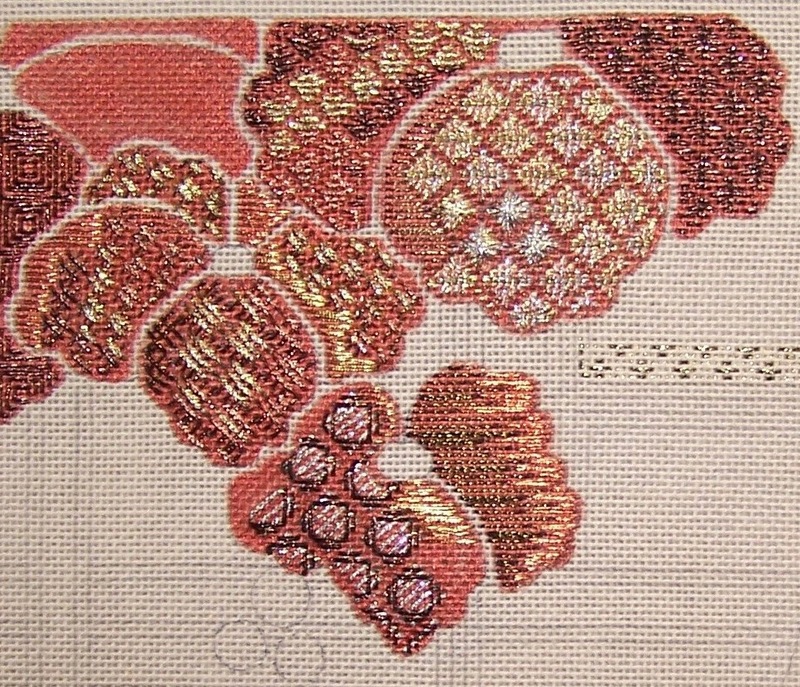 I finished this some time ago and never blogged about it. I decided the focal needed an edging. First I tried with the 15 hex beads I used in the focal. The date on that picture is early February. But they were too irregular. I set the piece aside until I could come up with something I liked better. I know I wore the piece in late February. 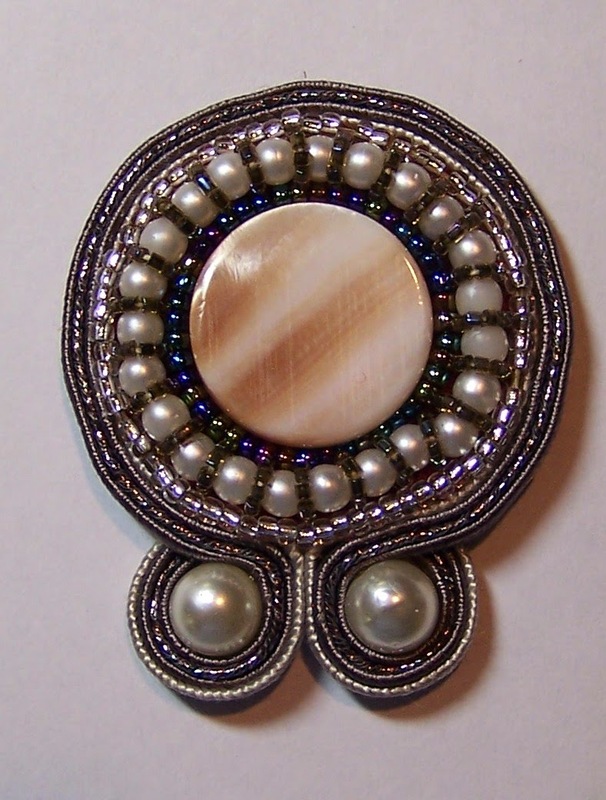 I wrote not quite a year ago about taking a class in Soutache embroidery. I wrote then that I was not planning to try it again. 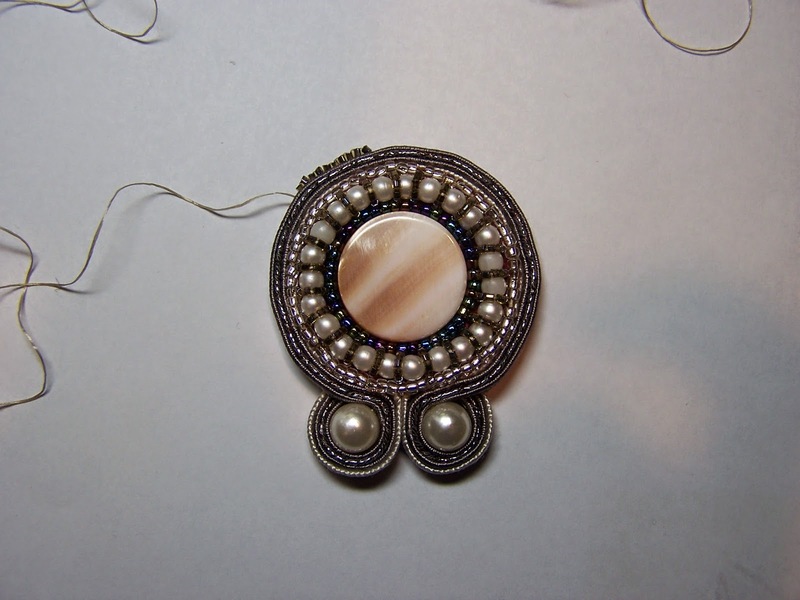 But I had some left over soutache braid and some beads to play with so I made a focal. I was thinking of making a pin, but I may add a chain and make another necklace. 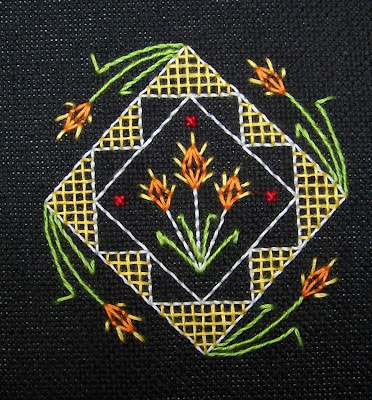 Sharon from Pintangle posted about a book that she found on the Internet Archive: An Embroidery Pattern Book by Mary Waring. 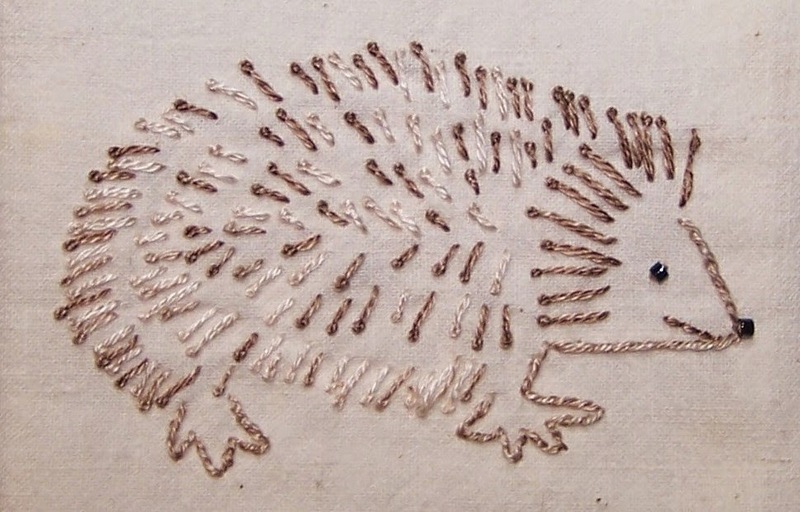 The hedgehog and mouse from page 119 of the book are particularly cute. This page is also reproduced on Sharon's page. Pages with larger animals (deer, lamb, pig) and other animals (frog, lizard, coiled snake) were not reproduced on Pintangle. Pages 130 - 133 of the book show some Interlaced Knotwork patterns. This book also has a page at Open Library where you can download a PDF. I am posting this partly so I can find it later. I enjoyed looking at the patterns in this book. I took this class at a regional seminar many years ago. 16 this summer I think. I put it aside to work on other things and never got back to it. 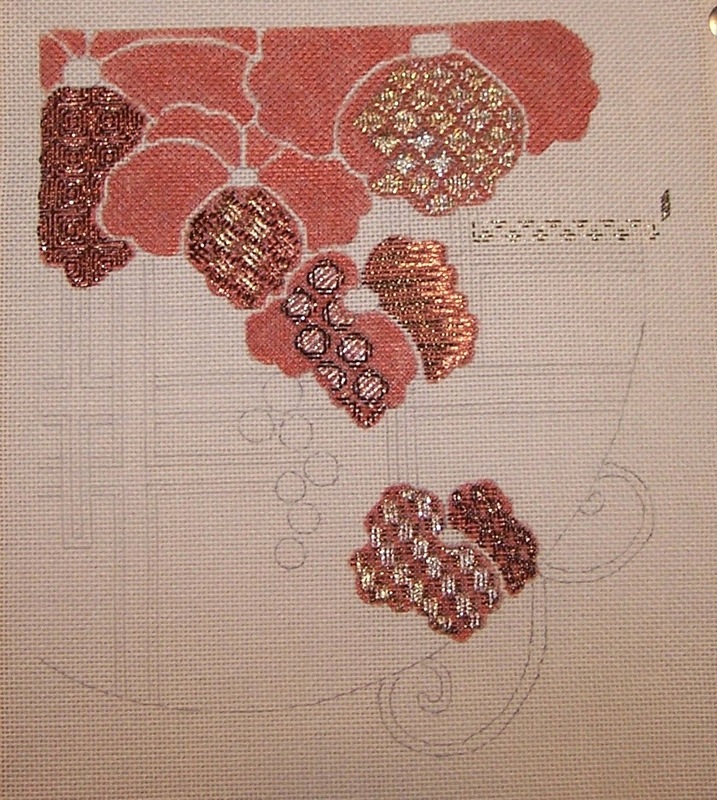 It is a partly painted canvas worked primarily with Krenik metallic braid and cord. I wanted to learn the techniques and never had a plan for the finished piece. 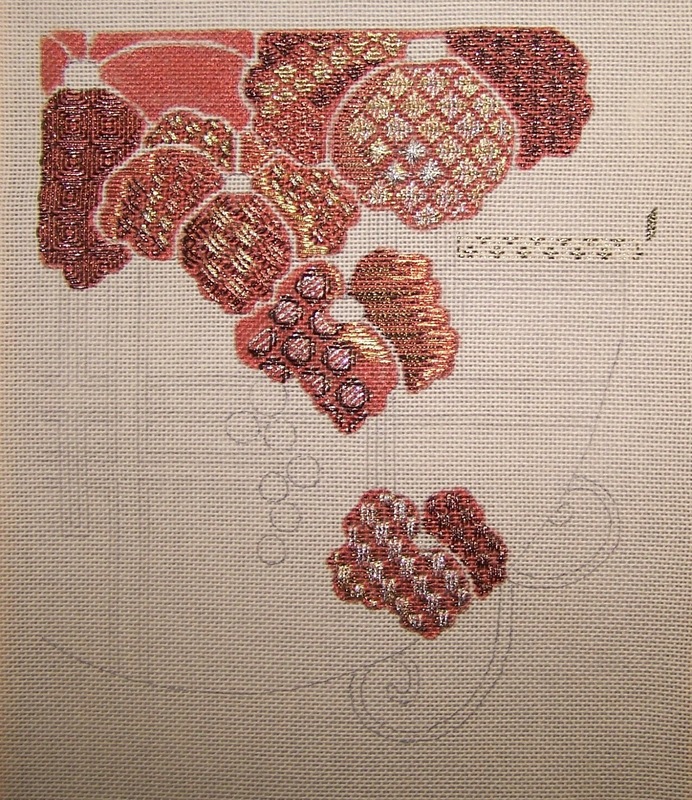 I worked on 3 of the leaves during the month of April. 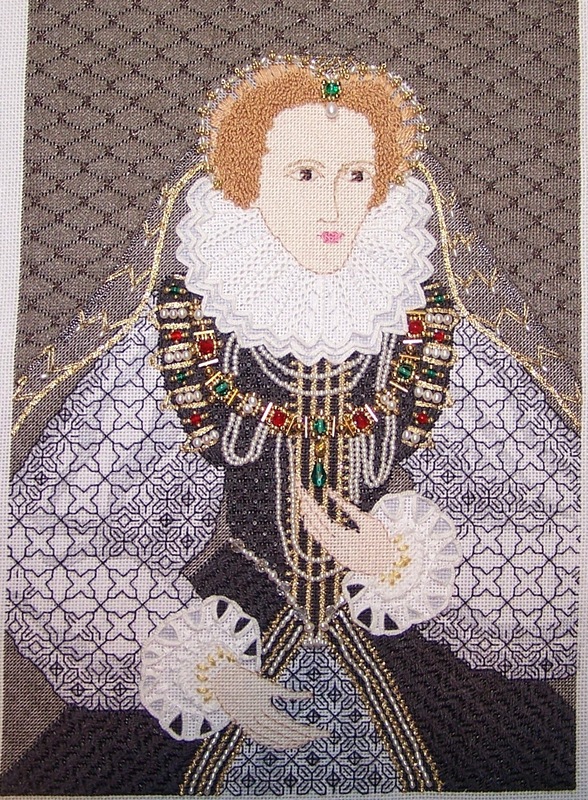 I finished Elizabeth some time ago, but had some camera issues. So I am finally getting around to posting a picture. I am still not really happy with some of the jewel placements. 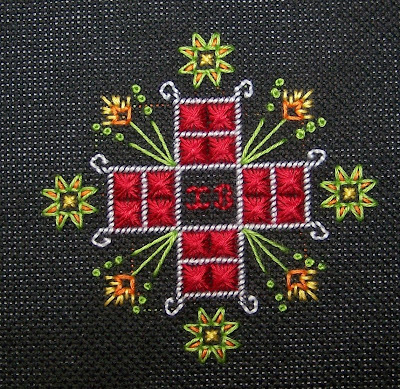 I have been stitching on various things since I was a child. 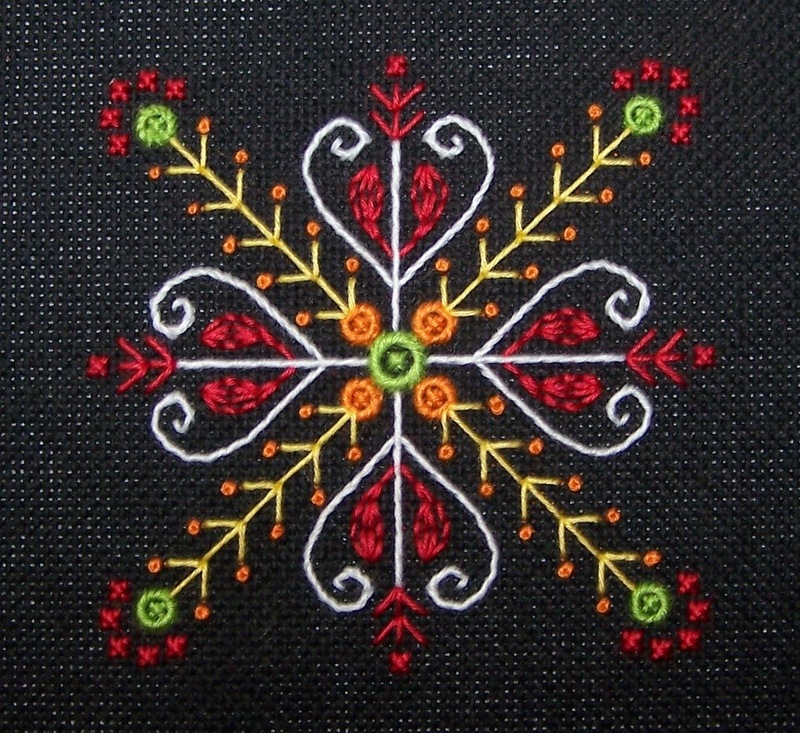 I have tried cross stitch, knitting, crochet, tatting, temari, needlepoint, and others.